After years of coaching, through trials and errors, some concepts seemed to be enduring and are shared here. It is amazing how runners blindly follow a generic plan, either downloaded from the internet, sourced from some running bible or simply taken from a running buddy. The simple fact is that “it wasn’t crafted with you in mind”. Think about it. Or even glance about you. Do you have the same running history, physique, mental makeup, professional commitments and so forth as the other runners? If not, then how can you be following the same training intensity-frequency-distance targets stipulated in generic plans. Personalization is key. High performance is nothing but an accumulation of mundane practice. Not from any single, or couple, or simply a series of workouts but by smart training, day after day. And for the athlete to be able to last the process, he needs to have some balance in his training workload. Yes. I am advising that you come into each workout with a clear objective. Do the needful, and cease. Mindful that there are many tomorrows awaiting you. If the runner takes the approach that “hey, I am feeling good today, let me do another X-kms”, he is only fooling himself. In the short term there may be no repercussions but it’s just a matter of time before it all catches up. Consistency is key. It’s really very simple. To be able to do quality workouts, you need to come into the session feeling refreshed. Start to think of your workout as incomplete till the required recovery period is completed, and you change your perspective. It’s not a matter of doing more workouts but of doing them right. Depending on your age and fitness levels, you will come to realize what suits you. Is it Hard: Easy (ie one day hard workout followed by an easy workout day) or Hard-Hard:Easy or even Hard:Easy-Easy (as in the case of the novice or senior runner, or the unfit). If you blindly follow a series of hard workouts then the simple truth is that these hard days aren’t hard enough. So park the “no pain, no gain” and “more is better” philosophies and set yourself onto the path to a longer running career. Train, not strain, is key. Take responsibility of your running life and don’t have excuses or abdicate it to others. How you progress is a matter of decisions you make. From as simple as choosing to wake up rather than shut the alarm, to doing mindful training versus every run is a social gathering, to bearing with the friendly jibs when you opt to hit the sack early and so forth. If you think of your actions as sacrifices then it’s a negative outlook, and you are unlikely to persevere over time. If you see your actions as choices then you take control of your decisions. The better runners will admit that their edge lies not in their innate athleticism, training or technical skills but their mind. They put in the deliberate practice again and again. And again and again. Attitude is key. After the dust has settled, and advocates of various diet fads been heard, the simple truth is that the elite endurance runners select high quality carbohydrate rich foods as the centerpiece of most meals. The choice of carbohydrate will vary by region but accounts for up to 80% of their calorie intake. Good carbs enable the athlete to do quality workouts and face less physiological stress despite its intensity. So less muscle damage, inflammation, immune system disruption, hormonal imbalances and nervous system perturbations are less. Although I am a purist and have a disdain for gadgets, I am a proponent of the Treadmill. Not to replace your outdoors run workouts but to support and supplement them. The sheer factor of convenience, variability that it allows and how a treadmill can be strategically utilized to address specific runner issues makes it an important tool. Treadmills offer a softer and uniform surface implying its easier on the knees, allowing you to train more often. But it develops your musculoskeletal system and stabilizer muscles to a lesser extent so don’t replace all runs for the treadmill. Most amateur runners have a narrow training window, largely early morning, or evenings, when the environmental and traffic situation allows outdoor running. Miss this opportunity and you missed out on your running workout. And it’s precisely at such times that a treadmill offers the convenient option. Woke up late? doesn’t matter. Treadmills offer the runner the convenience of setting a certain incline (few offer decline feature) and negates the need to travel afar in search for an incline or flyover. And most treadmills have specific courses and workouts mapped that you can follow too. But there is another aspect of running on a treadmill and one that I utilize a lot in my plans. And that has to do with developing the confidence of a runner to match a certain pace. Treadmill running is fundamentally whipping your feet from back to front, with the focus being more to match the set speed than to actually generate the pace yourself. Most runners will find this easier, and in the process gain the confidence that they can run at xyz pace. Now take them outdoor and watch them run stronger. Being versatile is key. Principle-7. Heart is a muscle. You can develop a stronger “engine” by doing a variety of cardio workouts and not be limited to running necessarily. Yes, running strengthens the heart and as a result it beats lesser but stronger, resulting in lowering of your HR and many other positive benefits. But if you accept that these same benefits can be achieved through cross training or other cardio activities then you widen your approach to training. I accept that running too often can become boring and that variety is the spice of life. So don’t be reluctant to add some alternate cardio activities to supplement your training. Just mind you that the impact element of running strengthens your musculo-skeletal system, an aspect that is necessary for distance running. So don’t substitute all your running for other means of cardio training. Add cross training to your training regime. As an amateur recreation runner, we are stretched for time and so it’s quite natural to want to devote the majority of time to the main workout. As a result we shortchange on our warm up, cool down and post workout recovery steps thereafter. Until it’s brought to our notice by our physio when we complain of tightness, of knots and so forth. I will focus here on the post workout recovery, and urge the athlete to be mindful of heeding a few points that can go a long way. Firstly, all things being equal, if you can do more quality workouts than you have an edge. And the key here lies in recovering faster. So ensure you are meticulous of availing the “window of opportunity” that asks you consume a 4:1 carbs:protein within 30 minutes of your workout. This kick starts the recovery process and catches the body when it is most ready to do so. Secondly, have regular intake of some form of protein across the day. This ensures your repair & rebuilding process stays on track. Catching the window of opportunity is key. Most athletes feel good having completed their morning workout and don’t give a thought to training thereafter. Some lead a busy physical life but most amateur recreational runners have a relatively sedentary day. Now if you open your mind and remind yourself that there are 24 hours in a day, and you could supplement your training with some simple lifestyle changes. Yes, I refer to productive activities that can’t be strictly defined as exercise but within your means. These could range from as simple as carry your laptop in our hands rather than on the shoulders. Using the laptop to do some isometric exercises when standing in a que. To walking across to someone’s desk rather than using the intercom. To using the stairs at every opportunity, skipping on the lift, or escalator. Even sitting straight at your desk. Maybe doing some core exercises at your desk. And so forth. Make fitness a lifetime partner. If you are injured you can’t train. And when you do return to training, you start a few steps back. All the gains in training need to be rekindled. What a waste of time! This aspect of availability is important as it dictates how you go about your training, and everything around it. You don’t try to go overboard, or too easy. You do the right things before and after the workout. And across the rest of the day. You think twice before accepting a silly challenge like streaking, 10×10 and so forth. It is a successful implementation of all the previous 9 Principles. Ash is the “lighthouse” for our amateur running space who commands respect for his running performances, his depth of knowledge and his fluent running style. He is a 9-time Boston Qualifier, thrice winner at the Mumbai Marathon and twice at ADHM veteran category besides regular podium winner at most larger domestic races. 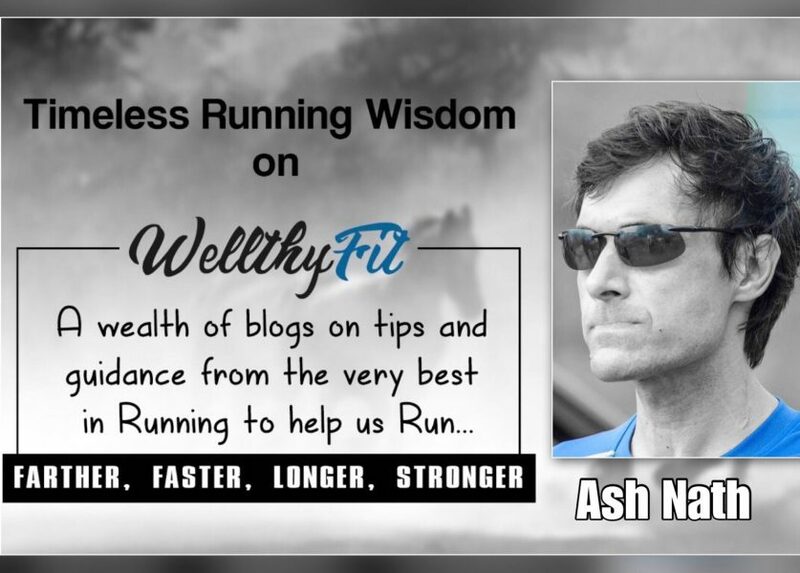 To return back to the sport he loves, Ash founded Catalyst Sports which operates in the running knowledge space. It undertakes Running Skill workshops across India, annual Mentoring engagements on a very personalized basis and contributes articles on running & fitness on request basis.Visit hereHis personal goals for 2018 are inspiring, with his head set to break into the Top-10 at the Boston Marathon in his age category and do a sub-7.30 at Comrades Ultra marathon. As a running evangelist, he has earmarked 2018 as the year to bring his workshops to newer cities outside the metros so as to spread the word.